If you’re willing to settle only for instant results, you’re seriously limiting what you can accomplish. Most things of great value take some time to achieve. Persist in your work, and you will be abundantly rewarded. The results that come over time are far and away the most precious. 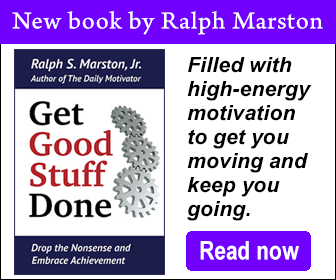 Copyright ©2005 Ralph S. Marston, Jr. All Rights Reserved. The Daily Motivator is provided for your personal, non-commercial use only. Other than personal sharing, please do not re-distribute without permission.